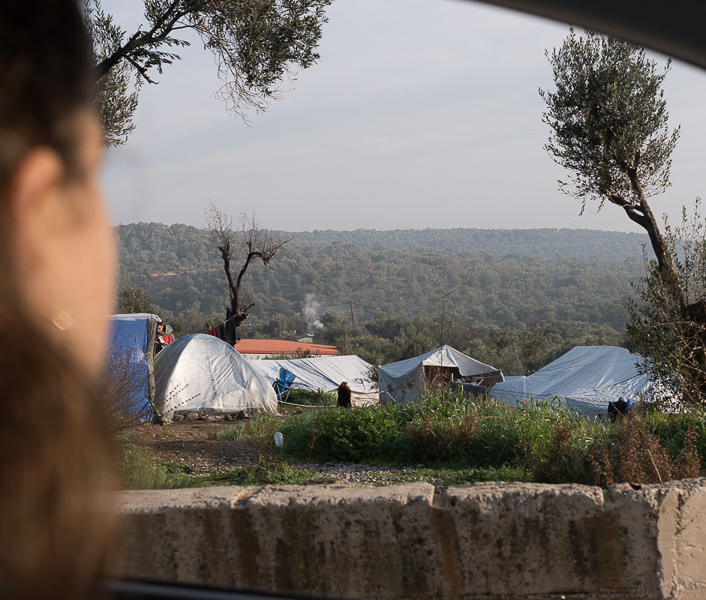 When refugees arrive in Lesbos they are taken to a camp located in the Moria suburb of Mytiline, the main city on the island. For those of you familiar with the Lord of the Rings, the name couldn't be more apt. Lesvos' motto on the island's website is "Welcome to Paradise." That's about a million miles from what the refugees in Moria experience. The graffiti above is what you see when you turn into the road where the main camp entrance is. Moria was designed to hold about 2,000 people as a transit camp before refugees are taken to other islands or the mainland. About three times that many actually live there, often for months, resulting in a sprawl of informal settlement around the main camp. 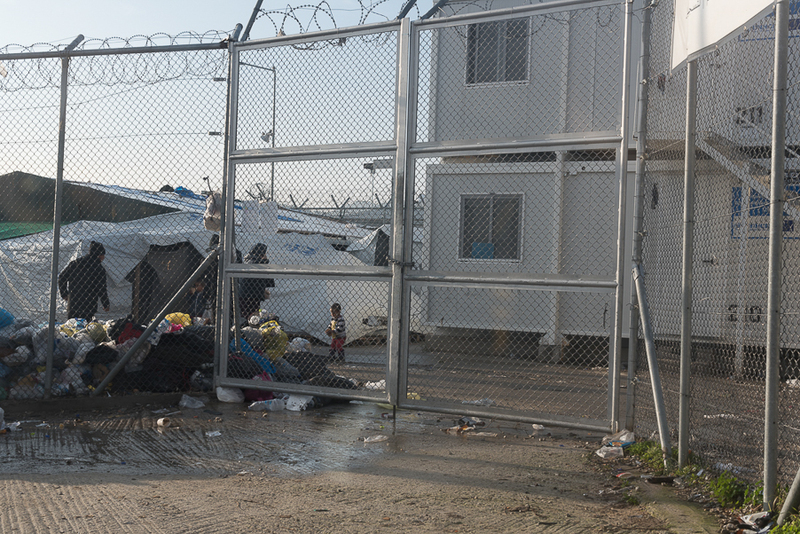 The camp is run by the local police; non-residents are not allowed in except with special dispensation, and if you try to take photos even of the outside and the police see you they react very negatively. Given the stories we hear from the residents it is easy to understand why. Those living on the inside are, it seems, marginally better off than those living in tents outside. My mum, and I, heard stories that were blood-curdling, with stabbings, beatings, and rapes common at night. Despite endless press attention to the riots, fires, and abuse and the promises to do better, the reality remains bleak. By the way, about a third of the residents are children, for whom there is no schooling, nothing to do. Unaccompanied minors are, in theory, better off; they tend to go to a second camp where the disabled, unaccompanied minors, and the like are sent. It is apparently better than Moria. As a European I find Moria and the entire cynical political construction that created it a monstrous monument of shame. You should too especially when you consider this is all de-facto deliberate: the Greek government cannot afford to take care of tens of thousands of desperate people without help (and routinely asks the rest of Europe for more help and doesn't get near enough; Italy is in much the same situation with the same results). We need to be honest with what is being done in our name as Europeans. The EU doesn't want to encourage refugees to come to Europe. What's the best way to discourage migration? Make life for those who get here miserable so they'll tell other would-be refugees not to come. And "voluntarily" agree to leave. Believe me, Frontex, the EU, the Greek authorities, everyone knows what's going on here. The combination of incentives just ensures nothing really changes. The photo gallery below gives you a sense of how bleak this is. A group of university students from the US did a great job documenting how ghastly things are; you can read their impressions, see their images and watch their videos, here. The tent city that's grown up outside of Moria, since it is able to hold only about a third of those who are really here. This part of the camp has only one row of barbed wire. Some sections have three. 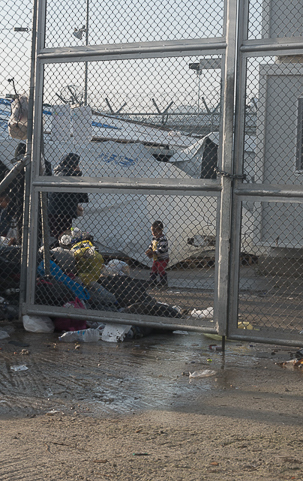 Families of up to 11 live in tents constructed out of scraps - this is just one of many.